Another interesting and simple design from The Tone God archives. Should make a nice quick project to build. 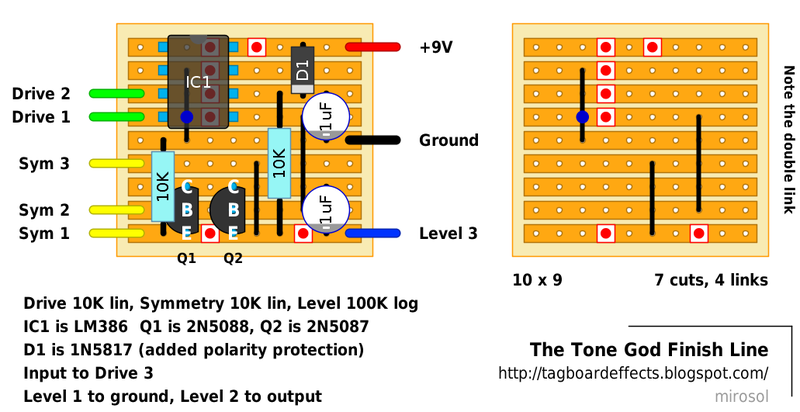 From the Tone God's site: A simple ten part non-selective frequency tripler. It creates octave-like sounds on lower settings and on higher settings generates a metallic swell effect through out the decay of the note(s). It is particularly noticeable with using bent multiple notes. The Drive control affects how much signal is going through the tripling portion of the circuit. When used at higher settings initial picked notes will pass unaffected but then go through the decay portion of the tripling. The Sym control affects the symmetry of the tripling which controls what portion of the decay cycle the tripling is occurring. The Level control affects the final output amount. Any subs for the LM386? I have no idea what this sounds like, but its not a lot of parts wasted if I don't like it.. Cool, will give this one a go as well at some point. It's testament to you guys that we now have several options for cross-over distortion! It seems this is similar to the Escobedo Tripple fuzz, but Escobedo uses another BJT instead of the 386 chip amp for the input boost. If you want to try a "non selective frequency tripler" but don't have the 386, there's also a layout for the tripple fuzz here at tagboardfx. Very odd this one. With the Sym control dead central I'm getting percussive distortion, not dissimilar to the Ampeg Scrambler. With the sym controls at 1 or 12 o clock I dont hear a lot happening. Might try a few different LM386. Also are the Sym 1 and 3 transposed? Cheers. If the the schematic is correct, then the Sym 1 & 3 are correct. He uses reverse numbering on the schem..
i'd love to hear samples of this!! hi all. breadboard this last night. had a similar experience like Otalgia FX. symmety control is no use (almost) for me, just a little difference from 4 to 6 kOm. i think i will be better to make it a trimmer, dial the best and stay with it. gain is the key for this circuit, as i see. 1 uF coupling is overkill for humbackers, i use 22 nF, sounds much more cleaner. and yes, it has scramblerish sound. Does anyone have a sound demo of this circuit? I seem to have got this working really well. Tried to gain match the transistors which isn't a quick job as these guys don't stray far from 530 and 430 Hfe, respectively. As close as i could get from about 50 of each type was 499 and 486. Obviously i have not tried without doing this so i don't know if it really has made a difference. But anyway its quite good with some unusaul tonal qualities. All pots seem to be doing what they are meant to. Symmetry control isnt much use and only works in a small part of the sweep. Which part? Could another taper remedy it? Or should it be modded in some other way? The symetry works only in the center region. Ive tripple checked and built two with exact results. Im using lm386L chip could that be the problem? If I stack it with overdrive it seems to be much more useful. By itself only "scrambler fuzz" can be achieved in the center symetry. The documentation from Tone God doesn't mention much..
You could try smaller value (5k, 2k) for symmetry pot to see if that would yield better control.